Bronte works at the picture desk of a popular weekly in Australia and when the opportunity arises for her to work for their UK sister magazine, she jumps at the chance to move to London for a year. She has a few friends in the city she is excited to catch up with and in the back of her mind also lingers the thought that maybe she'll see the gorgeous man again she shared a special night with when she was visiting some months earlier for her friend Polly's wedding. Though good at her job, Bronte's real passion lies with taking photos rather than organising the shoots. So when her wedding photographer friend Rachel is looking for an assistant, she is more than happy to help out and pick up some tricks of the trade along the way. Despite her self-proclaimed phobia for churches and the fact that she doesn't believe in marriage, Bronte loves her part-time gig and all the perks that come with it; including running into a gorgeous fellow Aussie who is travelling around the UK performing as a wedding singer. The story of Bronte attending thirteen weddings was a great way to have a lot of charmingly romantic settings in the book. None of the weddings were even remotely similar and I relished reading about all the different takes on the special day by the brides and grooms. The celebrations included everything you can possibly imagine, from a runaway bride and perverse vicar to magical moments of heart-fluttering love, which had even the most sceptical of guests brush away a tear or two. There was only one wedding that I didn't particularly enjoy, because I felt there was an irrelevant focus on the voluptuous female wedding guests and the comments became unnecessary malicious towards the end. It was just a brief part of the story, but it did grate on me while reading and I clearly still feel strongly about it! Other than that though, this was a well-thought-out and incredibly entertaining read. There were moments that made me laugh, others that nearly made me cry and I enjoyed experiencing the ups and downs with Bronte and her wonderful group of friends. Bronte herself was a likeable character and I grew very fond of her over the course of the book. She did seem to regress to a petulant teenager when visiting her childhood home and I willed her to see past her issues and realise there were people in her life that needed her support, but then the heart-breaking story of her troubled childhood was revealed and a lot of it started to make sense. The chemistry between Bronte, her one-night stand Alex and wedding singer Lachie was deliciously exciting. I usually roll my eyes at these sorts of love triangles as they've been done to death, but this one was unpredictable and compelling until almost the final page. Author Paige Toon kept us nicely on our toes by making both men a good fit for Bronte, not to mention completely swoon-worthy too! 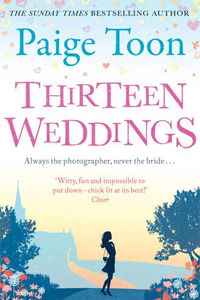 Filled with beautifully romantic wedding celebrations and plenty of page-time for the two aforementioned gorgeous men, Thirteen Weddings is a sweet holiday read you'd want to make space for in your suitcase this summer.